NOTCOT Note: Love these awesome necklaces that Anna from Sub-Studio found! Bernadette Deddens is a London-based accessories designer who views accessories as props that can add small-scale drama to daily life. 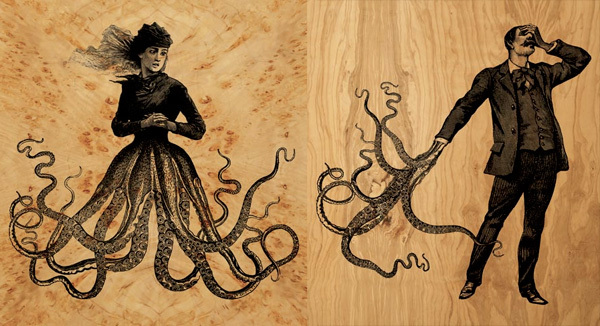 Her work is playful and often has multiple narratives, requiring interaction by the user. 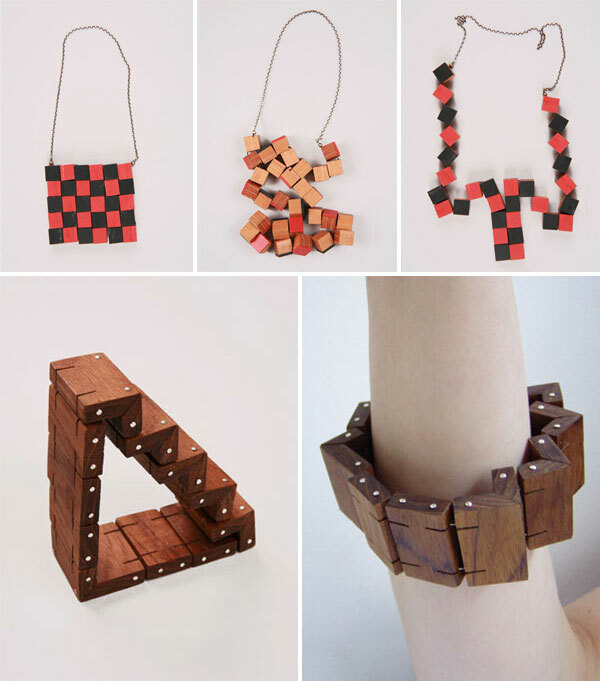 For instance, a necklace that begins by mimicking a checkered linoleum floor but that can be transformed by the wearer into hundreds of configurations, or a bracelet that is both sculpture and bracelet. Check out her shoe accessories after the jump - it’s a great collection of add-ons that dress up the shoes that you already have. Karma Balls! 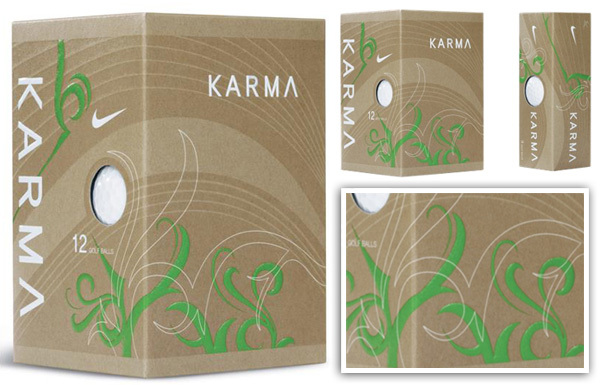 I am in love with the packaging for these Nike Karma Golf Balls ~ apparently, for the golfers, these are more forgiving on slower swings - they are ” Nike’s softest compression ball designed for added feel and distance.” You can read a review on the balls from 07 over at The Sand Trap… i discovered this fun grassy/cardboardy/vectory packaging over on BeSportier. Larger image on next page! 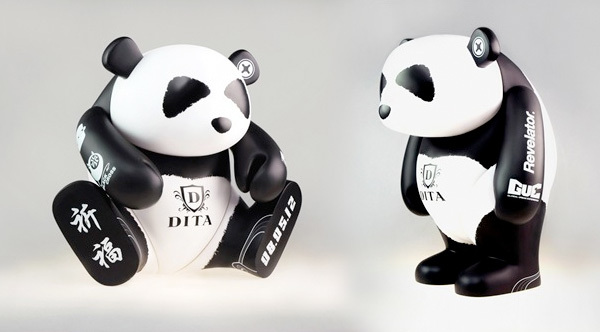 Remember when “toy stores” used to be for kids, then there was that shift of “toy stores” like kidrobot and giant robot… toys for grownups and saved in boxes as collectibles and untouchable toys when that vinyl toy trend kicked in hard? Well, due to some combination that i’m getting old and more of my friends are having babies, or its that time of year, i’m suddenly finding myself shopping for baby gifts more and more lately… and what’s been really fun, is watching these vinyl toys transform back into stuffed toys for our little ones! We all know that gifts for kids under 3 are really more gifts for their parents, seeing as the kids will barely remember them as they grow up anyhow. 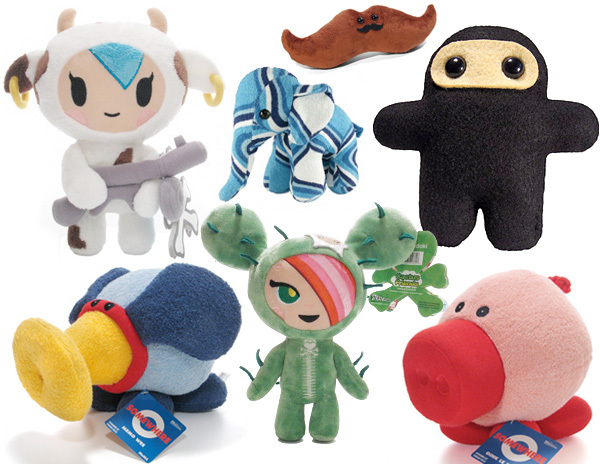 So for all the playful parents with a love for vinyl toys, various cheeky, slightly twisted characters, and designs from incredible artists… here’s a little roundup of stuffed toy options which i am considering toys that have come full circle, and are perfect for the babies of parents who loved the originals that inspired them… break down of the toys above on the next page! 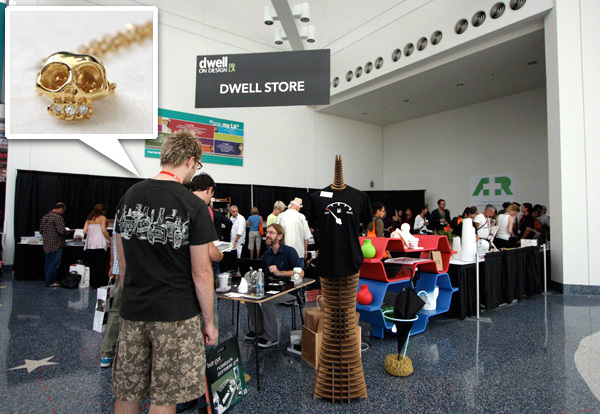 Highlight of the Dwell on Design LA exhibition… the STORE! Design superstore, A+R, and the best art+architecture bookstore, Hennessey + Ingalls, made up the Dwell on Design Store in front of the west hall of the LA convention center ~ and it made the trip worth it. While i spent about 5-10 minutes wandering the show floor, it was the store that really grabbed me… Andy forgot to tell me how many more of my favorite products were being added to the store (unfortunately not on the online store yet!) for this special pop up store! And Phillip of Citizen Citizen was here with more of his fabulous collection than is usually found in their stores as well! As anyone who ran into me over there knows… i was like a kid in a candy store, oohing and ahhhing and dying to buy things i’ve been posting about, that A+R now has… so if you’re in LA and bored tomorrow, perhaps pop by the pop up store in front of the exhibition… it’s before you even have to register for the actual show (Free Ticket To the Dwell on Design Exhibition: BDODEC). 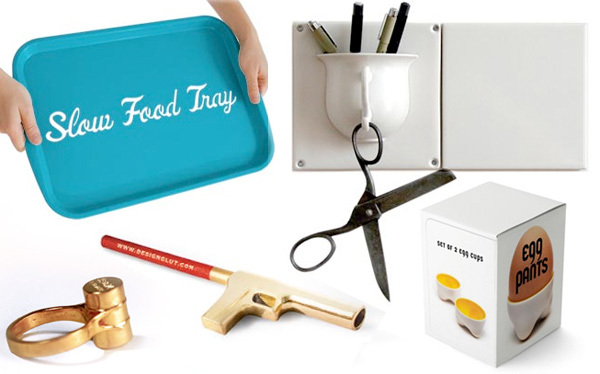 Take a look at the pics of the store and a few of the hottest items available! In addition to my growing porcelain fascination this ICFF, i have also been noticing a lot of Foosball Tables going more high design. During the Conran Shop’s Rojo opening (incredible! Definitely worth how wet i got in the rain to get there)… i came across the bright red metal RS Barcelona RS #2 foosball table designed by Rafael Rodriguez… and then saw the white one downstairs in the shop… the silver one at ICFF… and the coat rack versions in both the Conran Shop and ICFF. Really what stands out about this one is the bright metal frames and the arms and expressions on the player! Their faces scream “pass it to me! pass it to me!” with that excited/alert look… and their arms make them look like they are always on the go… which is admittedly, even funnier on a coat rack. There is also a hilarious stumpy super-buff silver and black set of players on another table i found at the Conran Shop that you’ve got to check out on the next page (and maybe one of you knows who made that one? 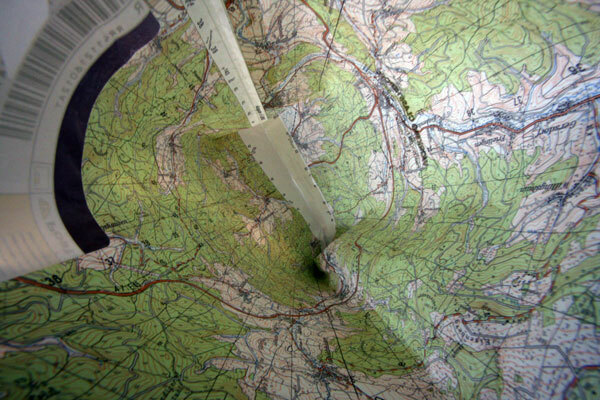 )… see all the pics on the next page! There is nothing like a yellow box with a ball on a string hanging off of it and the hint of a secret door… it might as well have screamed “PULL ME”. So we did. And i couldn’t stop laughing when out popped a porcelain cuckoo bird offering me a condom in its beak. So i let go, then pulled it again. Perhaps i’m still a 5 year old, but it was amusing! 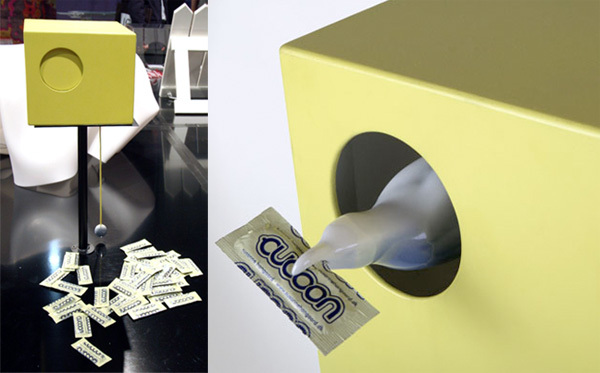 Susanne Hangaard’s Cucoon ~ silly play on words, craziest, yet most adorable condom dispenser i’ve seen. Now just imagine being right in the moment, and as your partner goes to reach for a condom, instead they pull a string and out *pops* a porcelain cuckoo? Would it kill the mood? 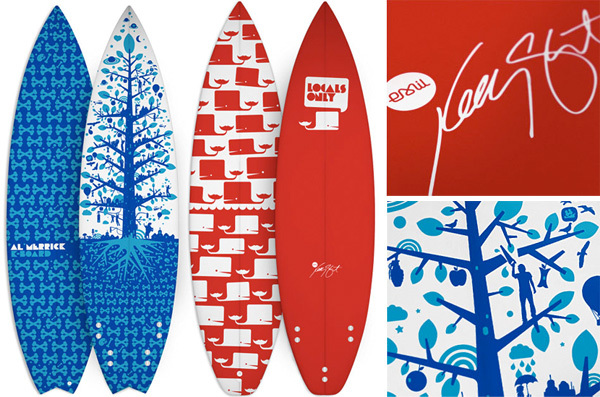 Help you fall faster for the playful design geek? Personally, i’m not sure how i’d react… other than a fit of giggles. My only complaint, why can’t it refill itself? Teach the bird to get its own condoms… its a bit high maintenance to have to refill it one by one… also, it could make for a fun business card dispenser (if only it could refill itself!). More pics on the next page! Um. Ok, i honestly don’t know where to start, i did sit in a diner and scribble out a “list of things i *need* to post about” and its getting a bit lengthy. Covered all of ICFF show floor yesterday, parties and openings friday/saturday night… and design week/end isn’t even over yet… i have that nagging feeling that i’m getting quite behind!!! SO, where to start? Well for designs/designers i finally met in person, i’m in love with the brooklyn based Design Glut’s collection of pieces, so cheeky, and they feel/look awesome in person!!! If you were ever on the border about buying some, they have just made my list of perfectly gift worthy. I basically need the Crude Ring, the weight and feel of it was much nicer in person! 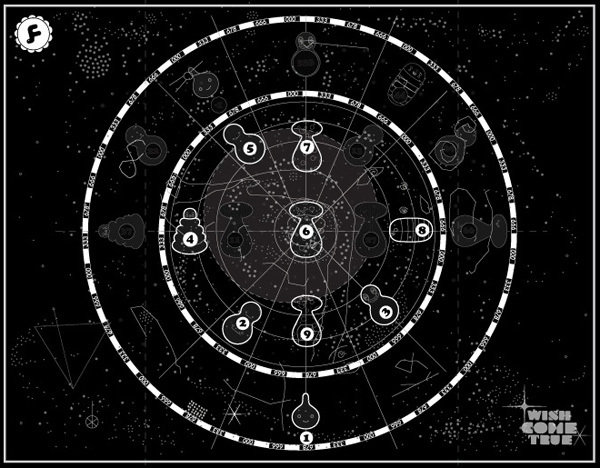 And the Hookmaker tiles would be perfect to swap into bathrooms/kitchens… to have that kind of space to hang and store those little make up brushes, hair things, and other randomness would be so nice. Their new little Smoking Guns are too funny, i want to pick one up for all my smokers, although it might back fire, sticking the barrel of that gun into your mouth might start to look too cool and become a trend of its own. Anyhow, take a look at the pics from the show on the next page… i will have far more to come throughout the next week, looks like posting will be my new excuse to slow down from the running around! On more sneak previews of ICFF launches, how adorable is Hanno the Gorilla? “From the deepest jungles comes Hanno the Gorilla! Like Hanno the Navigator, the Greek voyager who discovered gorillas 2,500 years ago, your Hanno is brave, strong, and curious. Hanno’s powerful hardwood frame can hold many poses. His elastic-band muscles and durable wood limbs make him almost impervious to breakage. Hanno cannot fly and is vaguely afraid of heights. Hanno is made from sustainably harvested new-growth beech wood.” He is the brainchild of David Weeks, and will be available from Areaware’s new AREAWARE jr. (their new children’s division) starting in Sept 08. Check out a close up of this guy on the next page! Fluffy Sheep! I’m gearing up for Design Week in NY… and somehow have gotten backlogged enough with everything other than posting… anyhow, i digress… Fluffy Sheep! 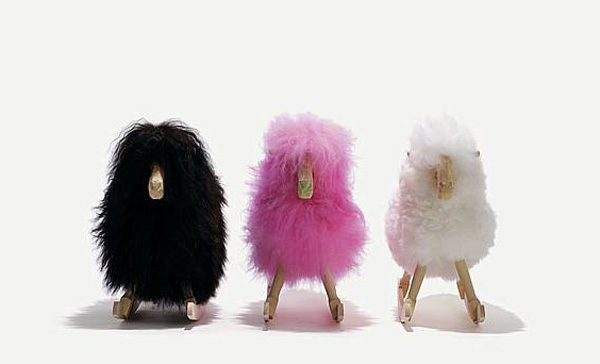 I first fell giddily in love with these at the Danish Crafts space at ICFF last year - and just noticed that this year they are launching in hot pink and black (and also an unpictured brown and grey)… these are designed by Povl Kjær, more pictures and the story behind the sheep on the next page! i’m so excited about heading to NY this week for nearly 2 weeks. 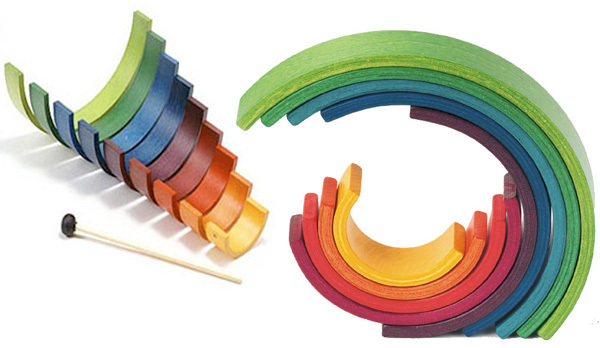 Naef makes the most incredible wooden toys that transcend age… with vibrant colors and unlimited possibilities, they are good from childhood through adulthood - being both toys, desk sculptures, and perfect for coffee tables/waiting rooms! I’ve obsessed on them before, and Dan has even purchased a few… but i recently rediscovered the Rainbow, which was designed by Heiko Hillig. D!REKTRECYCLING makes the coolest envelopes ever. They have become one of my favorite things about receiving packages from Working Class Heroes - other than the incredible felt/leather sleeves for my gadgetry, of course.